This photograph was taken at the Kenwood Hall Hotel in Sheffield at a wedding in early November. The weather was beautiful even though it was slightly chilly but still warm enough for a stroll around the grounds with our wonderful couple to capture them some wedding day images. We always try to spend some time alone with our couples after their wedding ceremony to allow them some quiet time together and to allow us some uninterrupted time to grab some images of the happy couple relaxing together. 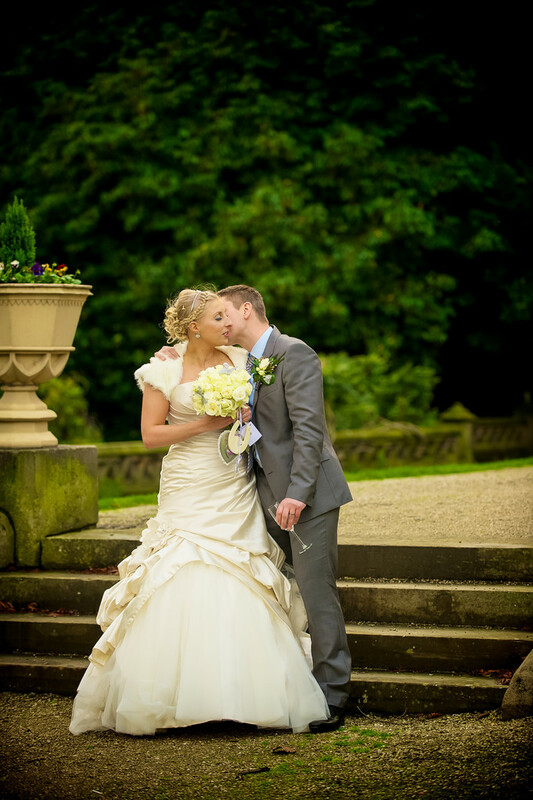 In this image the groom tenderly kisses his new wife on the neck as they wait for the rest of their wedding guests to join them at the bottom of four garden steps in the grounds of Kenwood Hall. As Sheffield wedding photographers we get to visit many of the wonderful wedding venues in and around Sheffield. We like them all for different reasons but mus admit that Kenwood Hall has some wonderful features and a special character we really love. The grounds are some of the best imaginable stretching to 12 acres and always looking fine. It doesn't seem to matter what time of year it is or what the weather there is always something to be seen, some new area to explore to create some wedding day photographs for our couples. The ability to look in and around different areas means that we can add variety to the photographs while including some of the obligatory ones from for example, around the lake.